From the Middle Ages the roadstead was the place of battle with the Anglo-Saxon kingdom. In 1692, following the battle of La Hougue, where a part of the French fleet was decimated, an order was issued to build fortifications. 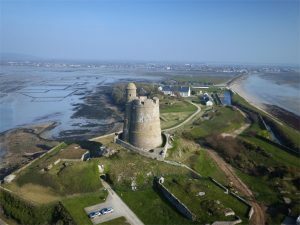 Two towers were built from 1694, intended to protect the roads of Saint Vaast La Hougue in the time of Louis XIV. They were erected on each side of the harbor according to the plans of the engineer Vauban, also Marshal of France. They are also listed as UNESCO World Heritage Sites. Not to be confused with the Vauban tower located in Camaret in Brittany (but also erected by Vauban). It is the most accessible tower since it is located on the coast. It houses the premises and equipment of the French Navy, whose visit is prohibited in normal times. However, you can visit the surrounding area, go around the peninsula and visit the tower itself during organized tours. Generally, from April 1 to October 8, Tatihou Island is accessible every day either by foot at low tide (provided that the tidal coefficient is greater than 70). See there) either by amphibious boat (reservation by telephone on 02 33 23 19 92, more information there). Other leisure activities: it is also possible to visit the museum of paintings on the island. In summer, the festival of the “les traversées de Tatihou” (“crossings of Tatihou”) fill the air with music and cheerfulness.